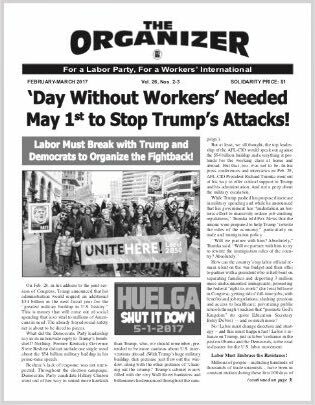 ‘Day Without Workers’ Needed May 1st to Stop Trump’s Attacks! On Feb. 28, in his address to the joint session of Congress, Trump announced that his administration would request an additional $54 billion in the next fiscal year for the “greatest military buildup in U.S. history.” This is money that will come out of social spending that is so vital to millions of Americans in need. The already frayed social safety net is about to be shred to pieces. 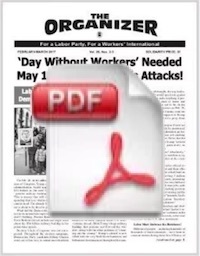 How can the country’s top labor official remain silent on the war budget and then offer to partner with a president who is hell-bent on separating families and deporting 3 million more undocumented immigrants; promoting the federal “right-to-work” (for less) bill now in Congress; getting rid of full-time jobs, with benefits and job regulations; slashing pensions and access to healthcare; privatizing public schools through vouchers that “promote God’s Kingdom” (to quote Education Secretary Betsy DeVos) — and so much more? While Trump pushed his proposed increase in military spending and while he announced that his government has “undertaken an historic effort to massively reduce job-crushing regulations,” Trumka told Fox News that the unions were prepared to help Trump “rewrite the rules of the economy,” particularly on trade and immigration policy. What did the Democratic Party leadership say in its nationwide reply to Trump’s bomb- shell? Nothing. Former Kentucky Governor Steve Beshear did not include one single word about the $54 billion military buildup in his prime-time speech. than Trump, who, we should remember, pretended to be more cautious about U.S. interventions abroad. (With Trump’s huge military buildup, that pretense just flew out the win- dow, along with the other pretense of “clean- ing out the swamp.” Trump’s cabinet is now filled with the very Wall Street banksters and billionaires he denounced throughout the cam- No! Labor must change direction and strategy – and this must happen fast! 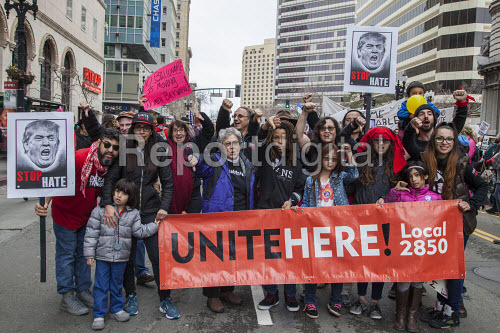 Labor’s reliance on Trump, just as labor’s reliance in the past on Obama and the Democrats, is the road to disaster for the U.S. labor movement. Labor Must Embrace the Resistance!